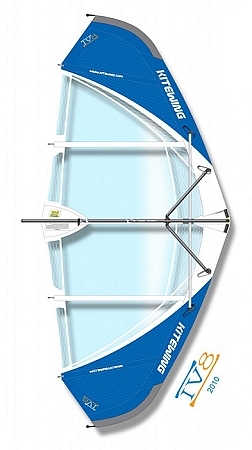 Kitewing IV8 [ai:vee:eight] gives incredible acceleration and speed with no loss in handling or control. For experienced users this 4,8 m2 wing is the tool to make incredible jumps, tricks and great airtime. The film materials are stiffer than traditional dacron materials. This makes the wing more responsive than the dacron version of the wing.